It's on a "five year journey"
Eager to get your hands on one of those shiny new HoloLens augmented reality devices? In an interview with the BBC, Microsoft CEO Satya Nadella says a developer launch is scheduled sometime during the next year. As for the rest of us, it may be some time before you can click to order one on Amazon - the device is on a "five year journey" according to Nadella, and enterprise users and businesses are going to get first dibs. Still, a developer release within 12 months is something to look forward to. Microsoft knows it needs plenty of apps and content for the HoloLens to be a success, and developers are going to be crucial to that. 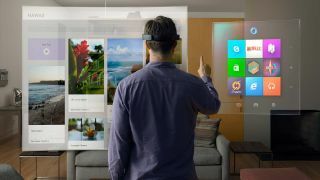 HoloLens was demoed on stage at the Build conference in April, and again at E3 in June, but despite rave reviews from the people who've tried it, the augmented reality headset is still very much a work in progress. The hardware will have to get more streamlined and more portable in the next 12 months, and it's not the only AR headgear that's looking to polish its act before going on sale to consumers - see also Google Glass. Elsewhere in the interview, Nadella said Windows was "a huge milestone" for Microsoft and the industry as a whole, "the beginning of the era of more personal computing" - and that means Cortana everywhere.